1 of 2 Bring tenderloin to room temperature 30 minutes before cooking. Heat oven to 400 degrees . Pat tenderloin dry and rub with oil. 2 of 2 Crush peppercorns in a spice grinder (or coffee grinder reserved for spices). Mix in a bowl with salt and press onto entire surface of tenderloin. Bake at 400 degrees for 45 minutes or until internal temperature reaches 137 degrees . Let rest 5 to 10 minutes, until temperature reaches 145 degrees , before slicing. 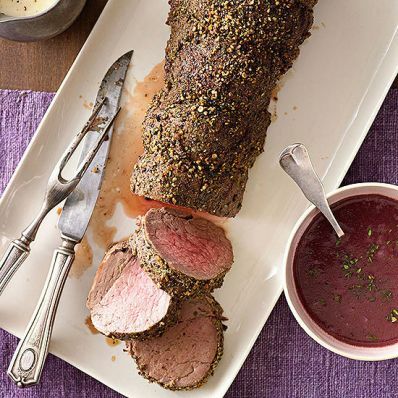 Serve with Roasted Garlic Cream Sauce or Red Wine/ Shallot Sauce. Per Serving: 9 g sat. fat, 111 mg chol., 23 g Fat, total, 347 kcal cal., 1027 mg sodium, 33 g pro., 0 g fiber, 1 g carb.